The 24.89 metre sailing yacht Clevelander, listed for sale by Georges Bourgoignie at Fraser Yachts, has been sold with Simon J. Turner at Northrop & Johnson introducing the buyer. Designed by German Frers and built in GRP by Nautor's Swan to Bureau Veritas class, she was launched in 2004 and has had several upgrades since including a refit in 2011 that included a new paint job. 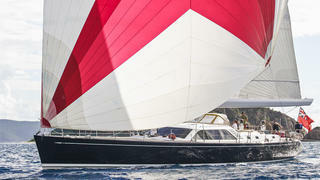 A true cruiser/racer, she offers comfort aboard plus great sailing performance. Her raised saloon features a U-shaped dinette, couch, bar and entertainment system. Fully MCA coded, Clevelander could make an excellent charter yacht. Her current layout accommodates six guests in three cabins consisting of a master suite plus a double and twin cabin and all cabins have en suite bathroom facilities. On the technical side, she has a carbon mast with stainless steel rod rigging and a moderate draft fin keel for improved upwind performance while still allowing access to smaller harbours and anchorages. There is also a leisure furl boom with a captive main halyard and captive main sheet for push button reefing and mainsail handling. In 2010 she gained a new sail wardrobe of a North Spectra mainsail, headsail and staysail. A hydraulically operated fold down transom forms a swim platform and gives access to the lazarette while, under power, a 220hp Cummins diesel engine gives her a cruising speed of 9 knots.